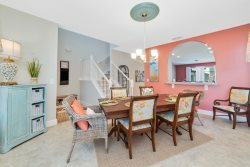 Florida vacation home with 5 bedrooms and 4 full baths in Beautiful Solterra. Brand New Construction in a fantastic Resort Style Community! All you could ask for, and more! Property Size 2,681 sq. ft.
A vacation experience that you won't find anywhere else! This is a brand new construction in the fantastic Solterra Resort! Located within minutes of all of Central Florida's Main attractions, yet it retains the quiet and serene setting to soothe and relax. Only a few short minutes from Walt Disney World and a short drive to Orlando's other famous attractions like Universal Studios, Seaworld, and Legoland. Our Solterra Resort villa sits nestled off Interstate 4 and Hwy 27, which has easy access to shops, restaurants, and world class golf! Don't forget to check-out the clubhouse, with world-class amenities, all included for free! 5 spacious bedrooms, 4 full bathrooms (and an extra half bath) and 2 stories of space - what more could you want? A private pool or spa? A fantastic game room? Space to relax and enjoy the Florida sun? Well this home has it all and more! This home also has (2) Master Suites - one on the ground floor and another on the 2nd story. Have a larger group that needs more space? Call or email us today to see if our other Solterra homes are available during your stay! Truly a one of a kind home, you can clearly see that the owner has gone the extra mile create a majestic space! As soon as you enter the home, the pastel tones & beach decor will instantly put you at ease and in a vacation mood. A full-size & very modern kitchen, plenty of seating and space, extremely comfortable mattresses & tasteful decor - without-a-doubt you will fall in-love with this 2 story vacation villa paradise! The kitchen features all new appliances, granite counter tops, a gas range, plenty of cutlery (silverware), pots & pans and everything else you'll need to have a fantastic and comfortable vacation! The ground floor living room sits adjacent the kitchen with plenty of seating for everyone! A large TV, cable box & DVD player await to keep you entertained! Straight past the living room takes you to the large pool deck, featuring tons of space for everyone, an outdoor dining area with seating, some lounge chairs to soak up the sun, as well as a private pool & spa! (Heating available for an additional fee). Upstairs is the loft, featuring a very comfortable sectional set-up perfect for late night movies! You'll also find a Papasan chair set-up in a little reading nook. Books, Board games, puzzles and more for the kids! Solterra Resort is a secure gated community only moments from the magic but far enough to experience peace from the busy tourist district. Solterra Resort is 15 minutes to Disney with access to the Interstate only 3-5 minutes from the entrance. Solterra's location also gives easy access to Universal Studios, Seaworld and even the Legoland theme park! Posner Park Shopping Mall is located 5-10 minutes away and features many, many shops, restaurants as well as a luxury movie theater! Many more shops and places to eat can be found along Hwy 27 and at Champion's Gate (about 5 minutes away). Click here to find out more about the shops & stores in Davenport! Solterra features its own club house (with free access) to a large swimming pool (complete with a water slide! ), a spa, 24-hour fitness center, business center, Volleyball Courts and Tennis & Basketball Courts, a soccer (football) goal, as well as a children's playground and picnic areas. There is also a restaurant/bar that opens for lunch (see amenities section below). The Lazy River is now open!! Solterra is located right next to Champion's Gate, which features world class golf with its 3 separate courses including a Greg Norman design as well as a David Leadbetter Golf Academy. Also around the corner is Reunion Resort with its Jack Nicklaus, Arnold Palmer and Tom Watson designed courses! Not to mention the numerous amount of other courses located all around Central Florida! Contact our office if you would like more information. Book now to secure your haven in paradise! ** The LAZY RIVER is now open! And a picnic area where you can enjoy a meal and relax. We loved our stay and would book it again the next time we are heading to Orlando! Solterra Resort is a secure gated community only moments from the magic but far enough to experience peace from the busy tourist district. Experience a world-class resort with stellar amenities! Solterra Resort is 15 minutes to Disney with access to the Interstate only 3-5 minutes from the entrance. Solterra's location also gives easy access to Universal Studios, Seaworld and even the Legoland theme park! Come experience a world-class luxury resort & luxurious villas!